This is another post in the Cancun series. 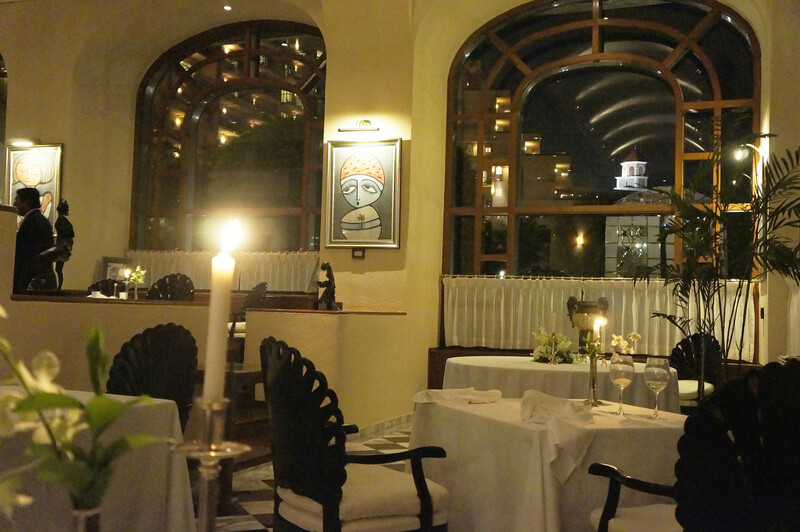 Le Basilic is a fine-dining Mediterranean restaurant in the Hotel Zone in Cancun. If you read a few of my prior posts on Cancun, you would have read about my preference to eat local food where the locals eat, so why would we eat at a Mediterranean restaurant? Well, the short version is that if delicious, local food is hard to find (I realize that “delicious” is subjective), and if we have to eat where the locals eat, then, we might as well eat where the locals enjoy the food even if it’s not the local cuisine. And that is why we ate at Le Basilic. This restaurant is at the Fiesta Americana Grand Coral Beach in the Hotel Zone in Cancun. When we were deciding where to stay, most Trip Advisor reviews stated that this hotel is non-inclusive, and so eating at the hotel restaurants proves to be expensive when the options are all fine dining. In my previous couple of posts, I wrote about the wait for breakfast at the hotel restaurant and why we were faithful Starbucks customers and about lunch at Isla Contoy. It’s only fair that I now share my experience about what is perhaps the best food in Cancun @ Le Basilic. After spending New Year eve ordering room service, we thought that we were right in choosing to splurge on a good meal at Le Basilic. We ordered a bottle of wine (a Cabernet from Chile), a salad of grains, sprouts, vegetables, avocado, figs, olive oil etc. (don’t you think we are eating healthy? ), an appetizer of seared scallops over sautéed spinach (healthy again, right? ), and decided to share the main course – a fillet of snapper cooked with espelette peppers and served with basil pesto capellini pasta. We thought we would share a dessert from the menu and call it a day. We were however, unprepared for several dishes that were served on-the-house or “with the chef’s compliments”. 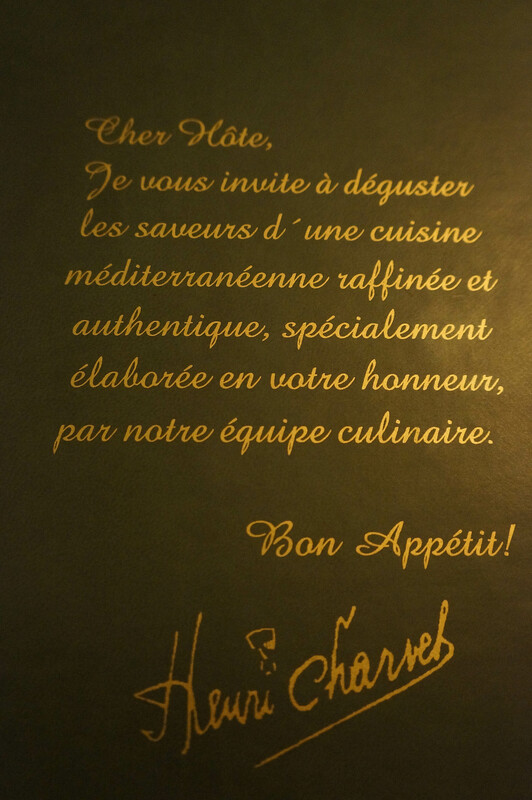 Chef Henri Charvet made us feel very welcome with a note (in French) preceding the menu. Back to what we ate and drank. It’s tough to find Chilean wine in the US – or may be I just haven’t searched enough. Whenever we travel to Latin America, we are always keen to enjoy the wines from wine growing regions in Chile, Argentina and sometimes, Peru as well. 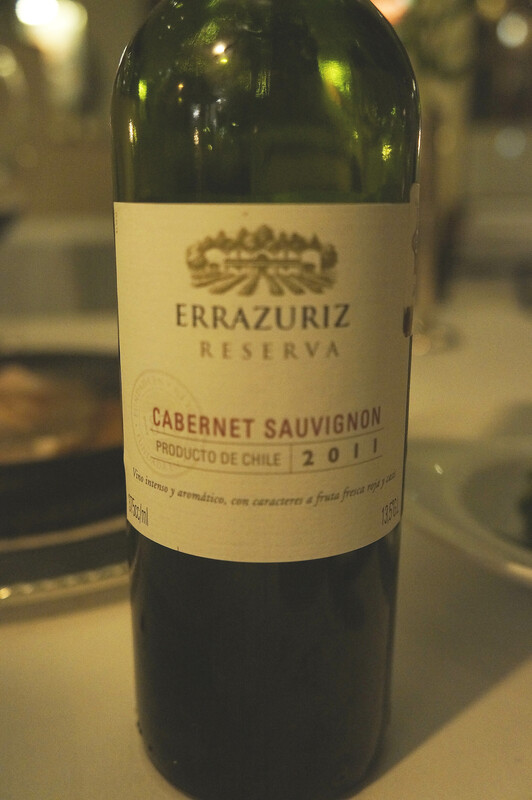 We chose the Errazuriz Reserva (2011) from Chile. I can’t remember much of how it tasted, but I do remember that its worth noting down to drink it again should I have the opportunity to do so. 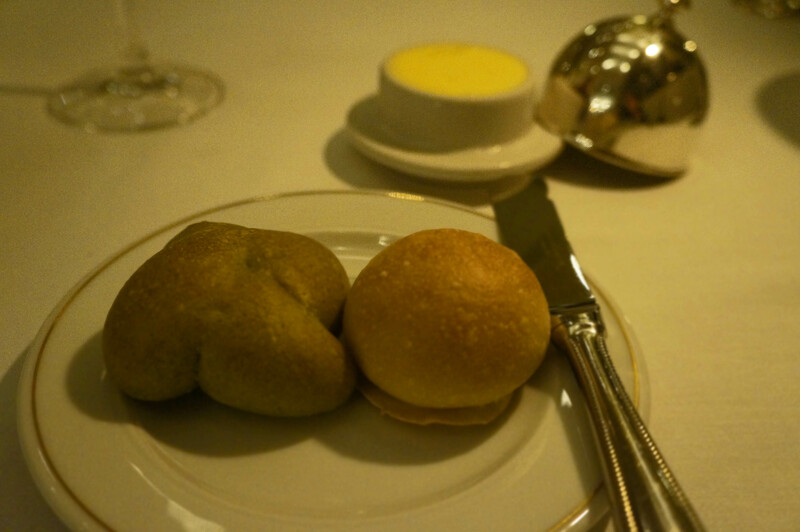 We were served 4 varieties of bread – one was Basil and another one was Olive. All that I remember about the bread was that it looked better than it tasted. 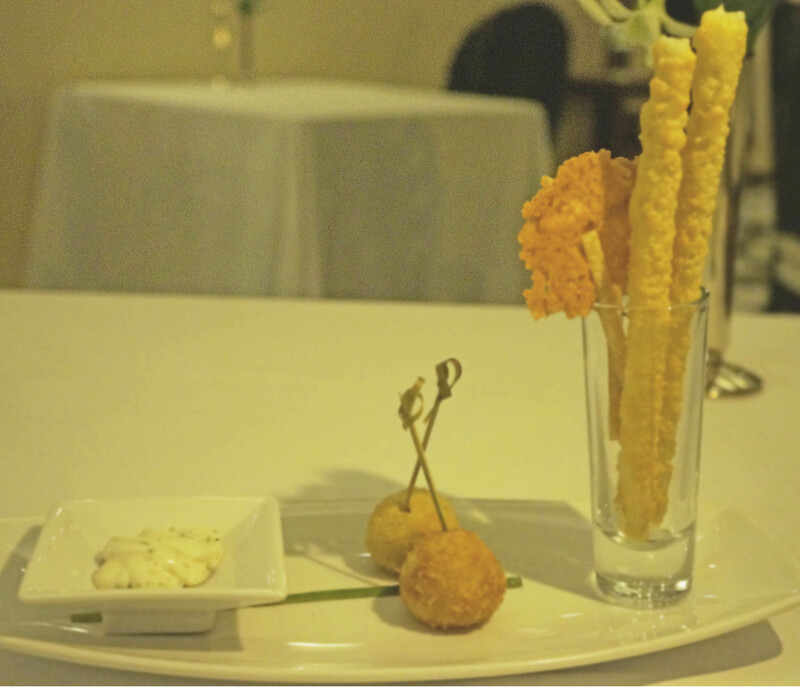 The amuse bouche presented was seafood croquettes, with raisin tartar and parmesan crisp on prosciutto bars with morning salt. The croquettes tasted of scallops and calamari and were absolutely delicious with the mildly sweet raisin tartar. The parmesan crisp with the prosciutto bars were divine. I am not sure if they will serve the same amuse bouche everyday, but you will be lucky if it’s served on an evening when you dine there. Another dish that was served on-the-house was vegetable cooked en cocotte served in a lobster ragout (*See note at the end of this post). The ragout was made with finely diced vegetables such as carrots (and celery? ), caramelized onions and herbs. The lobster pieces were tiny, but bursting with sweet buttery, richness. 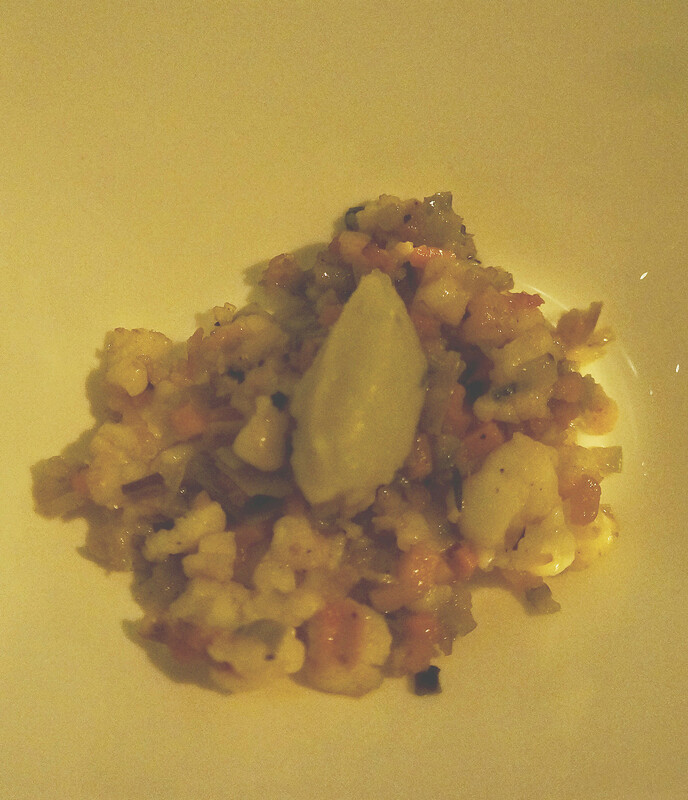 The menu lists the dish as Organic Garden vegetables with fresh herbs, cooked in cocotte, but not the lobster ragout. Vegetarians will be thrilled with this dish (especially if it’s served without the lobster ragout). Our salad was the ‘Mes Voyages” salad that had wheat semolina grain, raisins, chayote squash, chick peas, soy sprouts, chives, figs, dates, avocado, olive oil and balsamic vinegar. 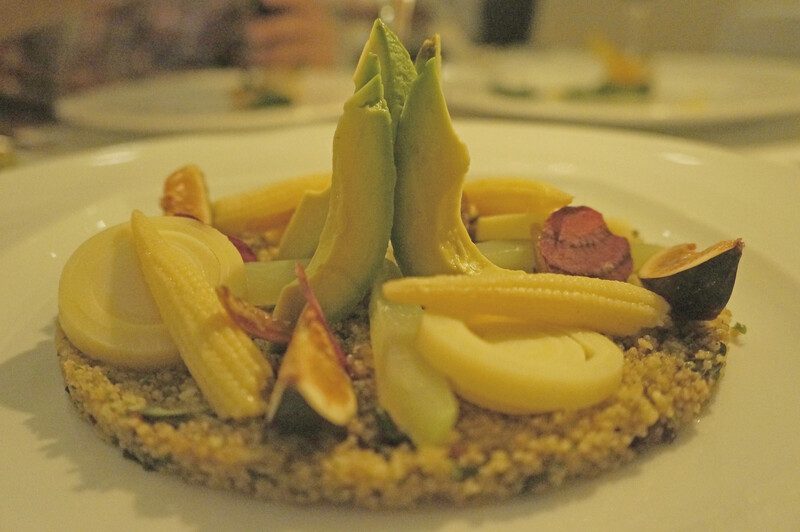 The salad had a nutty texture from the grains and sprouts but also had soft chunks of avocado and chayote squash interspersed with little bites of sweetness from the figs and the dates. If you are vegan or vegetarian, this is something you should not miss. The other appetizer that we had was seared scallops served on a bed of sautéed spinach and with saffron butter. The spinach was wilted perfectly and tasted as though it was sautéed in butter, i.e., delicious. The saffron butter was aromatic yet not overwhelming. The scallops were small pieces seared perfectly. 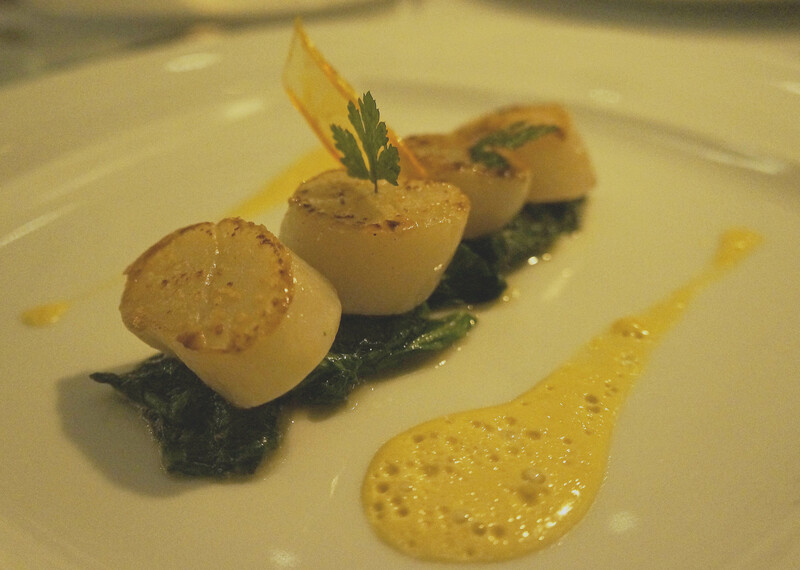 I took every bite of the scallops and spinach as though it was the last bite of the day – i.e., savored it as I chewed slowly and enjoyed every second. By now, we were feeling very good about the meal and were looking forward to the snapper provencale. 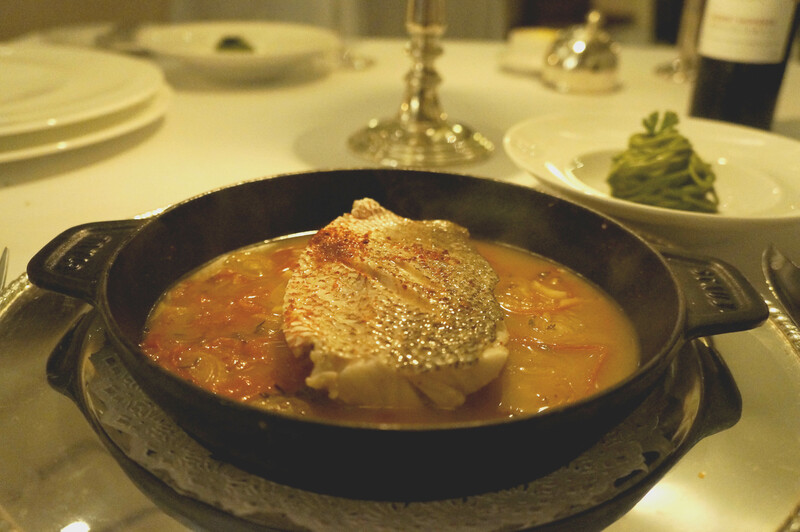 The snapper arrived in a soup / stew / seafood broth with espelette peppers (peppers from Mexico, that were introduced in France in the 16th Century). A small ball of basil pesto capellini pasta was served with the fish. The snapper had absorbed the flavor from the peppers in the stew / broth and was delicious to say the least. The basil pesto capellini pasta was the perfect side dish to the fish, although I cannot remember if the capellini was tossed in the basil pesto or if the basil pesto was mixed into the pasta dough. Not that it matters, because this dish is not worth missing. The dessert that we ordered was “Les Milles Feuilles”. Although we did not know what to expect, we thought it would be something delicate and not too heavy. What arrived was something pale in a martini glass with a couple of slices of strawberry. It was decadently creamy and sweet with hints of vanilla flavor. This dessert could not be “Les Milles Feuilles”. We thought that the server had made a mistake, but were too greedy to return this, and too satisfied to complain about the mix-up. We asked for the check, when another dessert arrived and that dessert looked like “Les Milles Feuilles”. It had 3 layers of pastry with some cream, raspberries between the layers, and a sorbet. This time we thought that they realized their mistake and brought us the right dish. 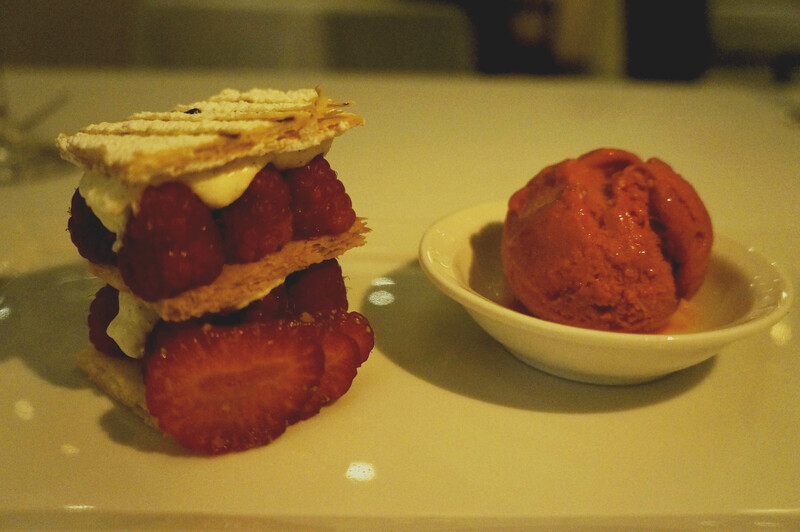 In any case, we enjoyed the delicate pastry layer (the top layer was dusted with confectioners’ sugar), and the super fresh raspberry sorbet. Turns out that the first dessert was not a mistake by the server, but was a version of Panacota “Strawberry” with the “Chef’s compliments”. This was a vanilla panacota with a strawberry coulis and strawberries (fried) in balsamic. The check finally arrived. Along with it, came a couple of macarons (Vanilla / almond flavored), couple of dark chocolate pieces with coffee filling, and raspberry gum drops. 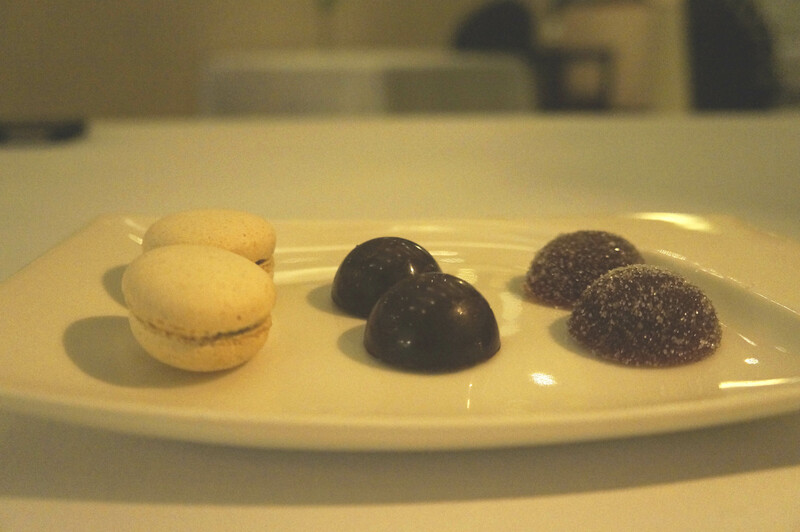 The 3 course meal that we planned on eating turned out to be 7 courses in all (including the macarons and gumdrops). 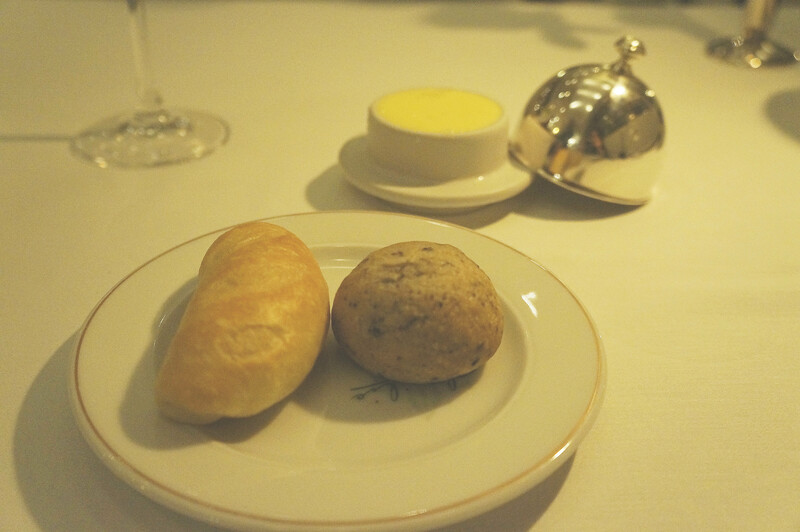 The additional courses are often common in Michelin star rated restaurants. Perhaps Chef Henri Charvet is keen on getting the Michelin star(s)? Overall, a very fulfilling way to start the New Year!! 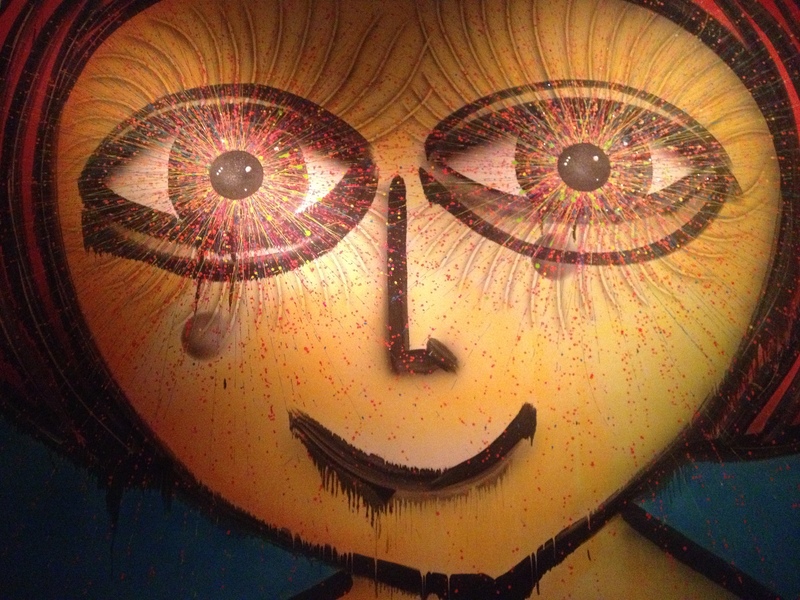 Besides the delicious food, what I liked best about this multi-level restaurant were the paintings by artist Leon Alva. If you are ever in Cancun, do not miss eating at Le Basilic – this fine dining Mediterranean restaurant – even though it has a limited vegetarian menu. It is worth every penny you spend here. Chef Henri Charvet’s cooking is unforgetable and delicious to say the least. When you make a reservation, let them know about any food intolerance, allergies, or dietary restrictions that you may have. The chef may be able to make / modify dishes as necessary. 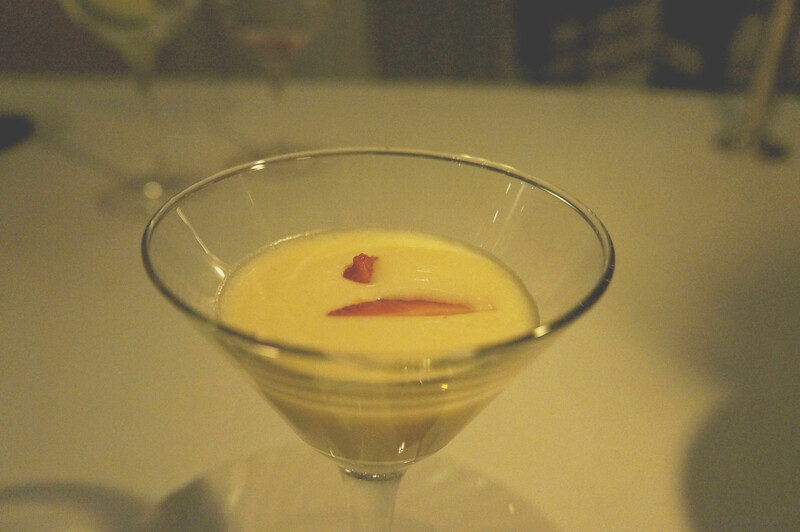 (*) : The details of the dishes served as amuse bouche, and with the Chef’s compliments may not be accurate. I had trouble following the accents of the servers.